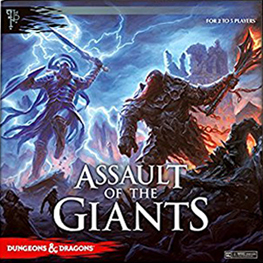 Assault of the Giants allows 3-6 players to command armies of giants as they wage war throughout north west Faerun. Each player represents a different giant race (hill giants, stone giants, frost giants, fire giants, cloud giants, and storm giants), each with a different agenda. The players command their giants as they assault the small folks' villages and cities in order to score points and secure important resources such as food, artifacts, ore and runes.